Here's where you can discuss the first Swordbird book and Nancy's first published book, Swordbird! Swordbird was started by Nancy when she was only ten-years-old, and she got it published with HarperCollins when she was twelve. She went looking for publishers names looking for advice, and she sent some of her book to Jane Friedman the CEO of HarperCollins. She was impressed with Nancy and got Swordbird published! Swordbird is a good VS evil story about blue jays and cardinals struggling against an evil hawk. The main characters are Miltin, a robin, and Aska, a blue jay. Here you can talk about the second book by Nancy Yi Fan,Sword Quest, prequel to Swordbird! Sword Quest is about Swordbird, Wind-voice in this, and how he finds a sword so that he can battle evil. Sword Mountain is the upcoming prequel to Sword Quest. The plot is that on her sky-born day, Dandelion is injured and separated from her parents. The exiled musician prince, Fleydur, comes to her rescue and brings her to the Castle of Sky. But the court life of the golden eagles is still dominated by rigid traditions and intrigue, and now a new threat is looming. As flying, swordplay, and music enter her life, Dandelion will have the chance to show that a valley eaglet can be a true princess and a heroine, too. Bravery, equality, and the gift of music triumph over all. 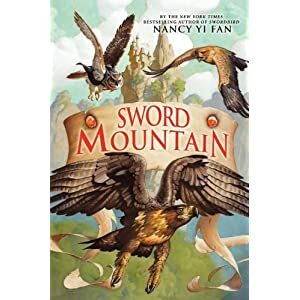 Nancy Yi Fan is the fantastic young author of Swordbird, Sword Quest, and the coming-soon Sword Mountain. She started Swordbird when she was ten-years-old, and got it published at twelve. Not much later, she published Sword Quest. Nancy Yi Fan reached the New York Times Bestseller List, got many positive reviews from critics, and was featured on the Martha Stewart Show, Operah, and more! Here's the place to relax and talk to you friends! :3 There's a thread here for general chatting, and then you can also make topics for discussing for example, dreams, or maybe cooking. Threads for music, TV/movies, books, and other things that would fall under media, however, have their own section. Have some art, maybe some writing, a video... something probably that you created, that is not related to Swordbird, that you'd like to share with us? :3 Post it here! Here is the place to do RPs that aren't Swordbird. It can be funny, it can be action-packed... make it however you'd like! Because there might be RPs with not much point (ones that are funny or random maybe) you do not need to have your characters approved by me, Wheatley, but instead they are approved by the person who made the RP. :) Just post a bit about your character on the topic, and when the RP's started says you can, start RPing!